What is the one phrase that these three verses have in common? It is "The Son....Can do nothing of himself". One of the many examples of this is found in John 11. Lazarus, is terribly sick. So his sisters sends word to Jesus to come quickly because Lazarus was not going to live much longer. I would guess that knowing the stories of how leopards were healed, blind receive their sight and cripples were able to walk, Mary and Margaret thought that Jesus would heal Lazarus out of love for the family. I also believe that hearing of His friend’s sickness, many emotions were stirred in Jesus’ heart. Just imagine how you would feel if your closest friend was terribly ill and dying in the hospital. Would you not rush to your friend’s aid, laying aside everything else just to be with him in his time of need? “And Jesus hearing it, said to them: This sickness is not unto death, but for the glory of God: that the Son of God may be glorified by it. Now Jesus loved Martha, and her sister Mary, and Lazarus. When he had heard therefore that he was sick, he still remained in the same place two days.” (John 11:4–6). “Lord, if thou hadst been here, my brother had not died.” (John 11:21). The moment Jesus heard the news about Lazarus, He looked up and asked His Father what He must do. The Father must have told Him, “Son, it is not the time. Wait.” And so Christ waited. And He waited. And He waited some more. He waited so long that by the time he did get to Bethany Lazarus had been dead for four days. And so Christ waited, demonstrating absolute submission to His Father’s will. “Father, if it is Your will, take this cup away from Me; nevertheless not My will, but Yours, be done” (Luke 22:42). It was the Father’s will for the Son to drink the cup that He gave Him. Even though inside Jesus pleaded for it to be taken from Him, He yielded to the will of His Father. In life and in death, Christ showed how He submitted Himself to His Father’s will and authority, leaving this as an example for His disciples—and us—to follow. Jesus also recognized in the garden of Gethsemane, as the Roman soldiers came to take Him away, that they “Thou shouldst not have any power against me, unless it were given thee from above. ” (John 19:11). And we must recognize the same in our lives, allowing each circumstance to be used as the tool to produce in us the submission and humility of Christ. “Look at me and do likewise; watch, and when I come to the edge of the camp you shall do as I do” (Judges 7:17). Gideon had his men surround the enemy, holding these clay pots in their hands. When he gave them the go-ahead, the men were to break the pots and cause the light to shine out (Judges 7). They followed Gideon’s command and defeated their enemy that day. These 300 men were totally committed to following Gideon’s instruction regardless of how illogical it seemed. They had no opinion of their own or suggestions for Gideon on how to win the battle. Their attitude was, “Whatever you say, we will do.” Their submission to the authority of their leader was complete. And so it must be in our lives—total submission to God our Father. In 2 Corinthians 4:7, Paul writes, But we have this treasure in earthen vessels, that the excellency may be of the power of God, and not of us. But unless we come to the place of giving up our stubborn will, our own ambitions and our way of doing things, the light of Christ will never shine out from us, the earthen vessels. I believe this is true. If Jesus had not submitted and listened to the Father, If he had not waited until the Father said go, If He had not had the spirit of "not my will but thy be done", concerning Lazarus, the glory and power of God would not have been displayed through his resurrection. If Gideon’s men decided their leader was foolish and therefore did not submit and follow his command, the battle never would have been won, nor the victory given to God. 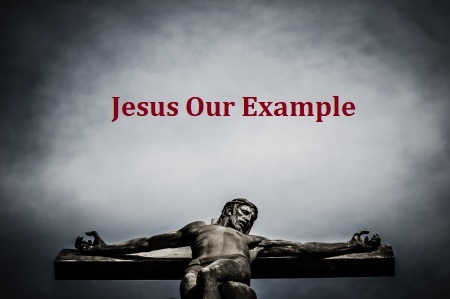 Jesus has set before us His submission as an example that we might do exactly as He has done. I Corinthians 4:2 says, Moreover, it is required of stewards that they be found faithful. Let us then press on to follow our Master—Jesus—and live this kind of life pleasing to Him, sustained by the submission, humility and love that we see in Him.